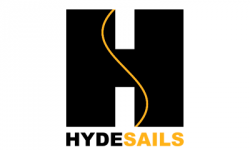 The best sailcloth for producing Cadet sails is 3.8 Polykote sailcloth and it is best used in a cross cut panel layout. The thread lines and bias stretch allow the sail designer to shape the panels to stand up in the light winds while the inevitable stretch can be utilised to depower the sail. With the panels running into the luff at an angle the bias on the cloth allows the Cunningham to work effectively.